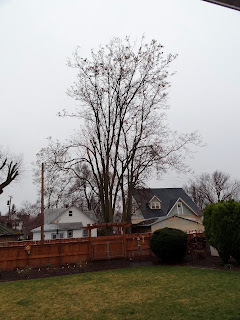 Ever since we purchased the Squash House, there has been an Ailanthus tree in the neighbor's yard which has been the bane of my existence here! It makes thousands of seed pods, each pod holding another thousand seeds, which all fall or get blown into our yard - and most of them germinate! I've spent hours and hours pulling little baby Ailanthus trees out of the beds and the lawn. Mr. Squash has also pulled his share of them and raked and raked the mess from it for what seems like each month of the year! 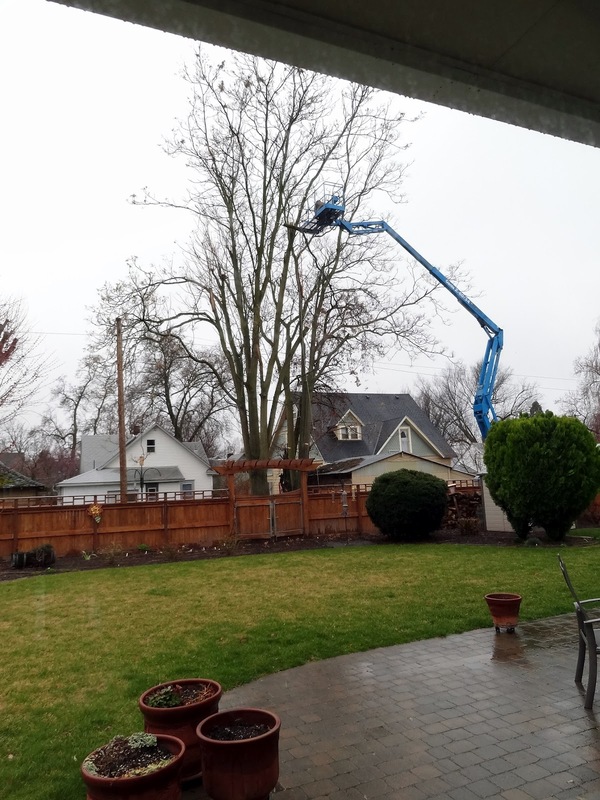 Even the neighbor who owns the tree doesn't like it! 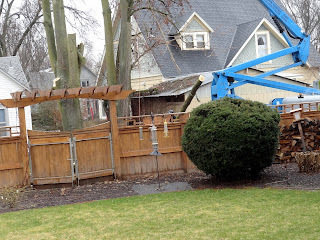 Well, from now on, neither the neighbor or us will have any more worries from the tree because yesterday it came down! We reached an agreement with the neighbor to have it removed. 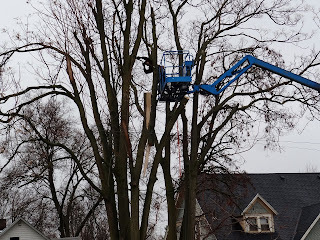 A certified arborist and his crew began the work yesterday and will finish today. 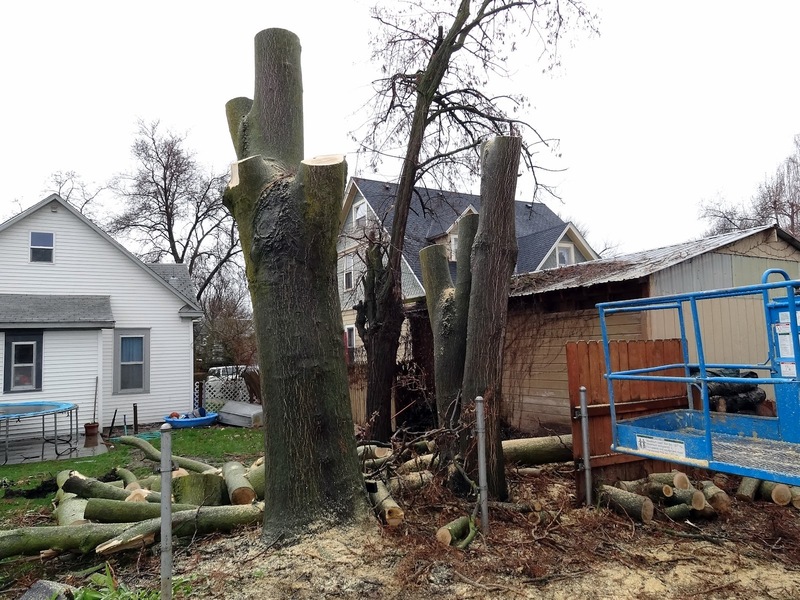 I thought you might like to see some of the dramatic moments from the removal process! Here is the tree prior to the crew arriving. You can see it was dark and rainy all day! Andy is just getting set up in the cherry picker. He said they normally climb the trees and cut them, but since this one is next to the alley and very spindly in sections, along with the weather,he felt it best to be safe. 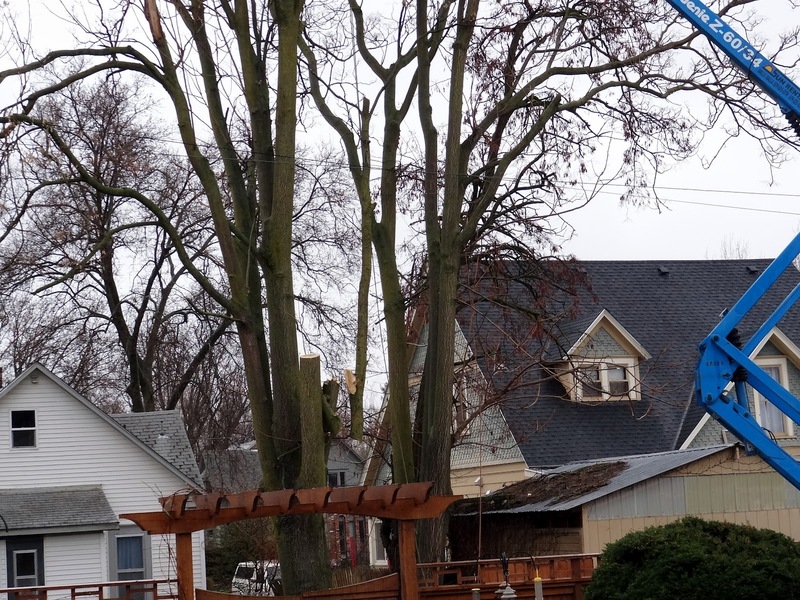 If you click on this photo you can see one large section being lowered to the ground. Click on the photo here and you can see Andy ducking just after he cut another large section! He was fast! Here's a short video I made of an exciting piece coming down! 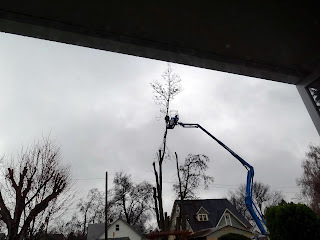 The noise you hear is from the chipper they had running in the alley as well as the engine for the cherry picker. I pretty much stayed in front of the window all day - I was somehow fascinated by this process! I was really afraid they were going to destroy our new fence here, but they were always in control! 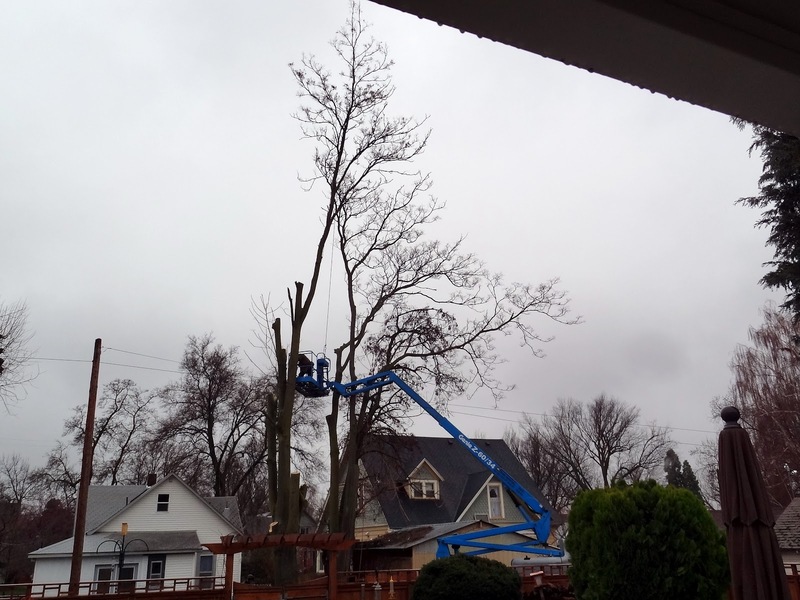 Finally, the last limb comes down! This was around 2:30pm - not bad for having started around 9:30am! 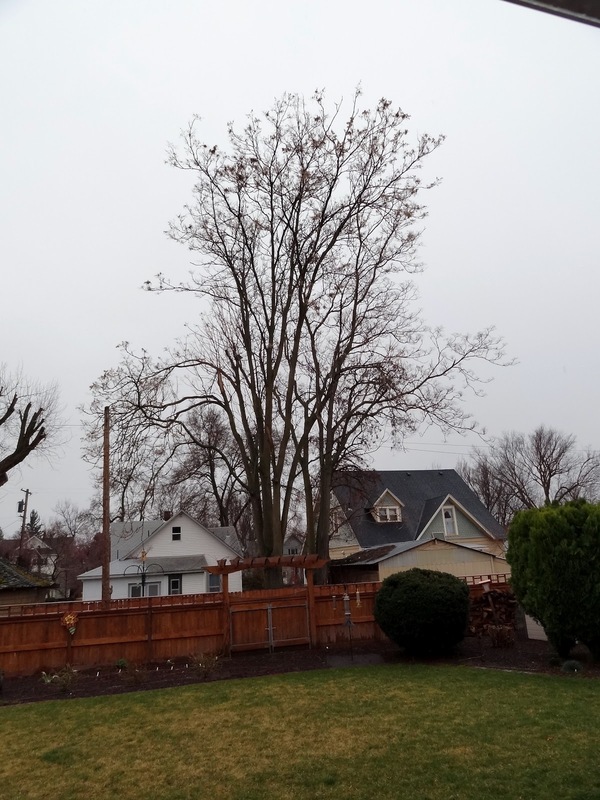 Today this will all be gone, and so will our days of the dreaded Ailanthus tree! 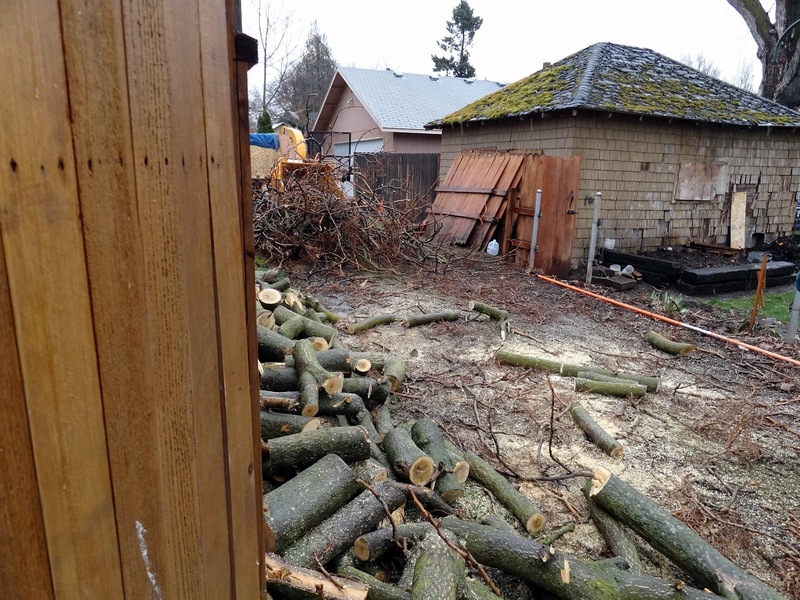 and look at all that fire wood! It is fascinating to watch real professionals at work. Your garden will flourish now that the tree is no longer taking up all the water and flower vitamins from your soil. 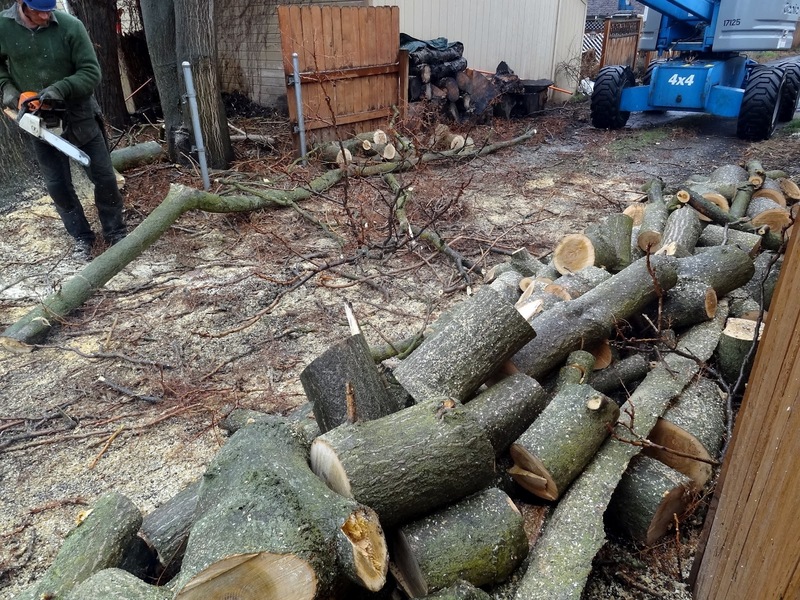 Someone is going to have some awesome firewood! 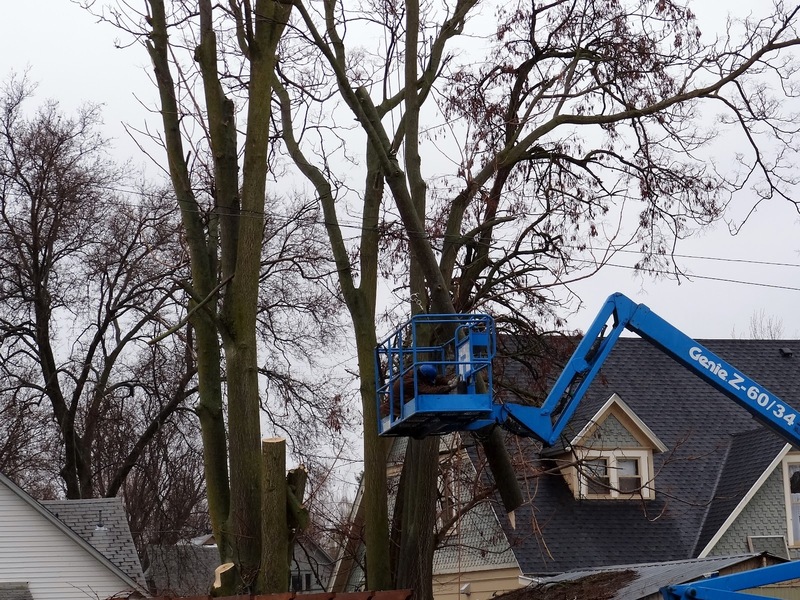 It's quite riveting watching a tree come down. We had to have a HUGE sycamore taken down and they called in the smallest guy to climb up and so some of the initial cutting. They also lost of the trunk and it went about 2 feet into the ground, cutting our phone lines, which are underground. Now you can spend more time quilting and less time pulling up baby trees. Oh my goodness, these guys are good! I think I would have been at the window as well. Good filming skills, Candace. I never heard of that kind of tree but it is a big one! Glad you'll all be rid of it now. 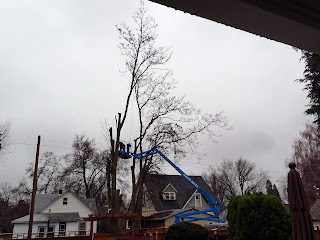 We had a 120 year old diseased tree cut down over Christmas. 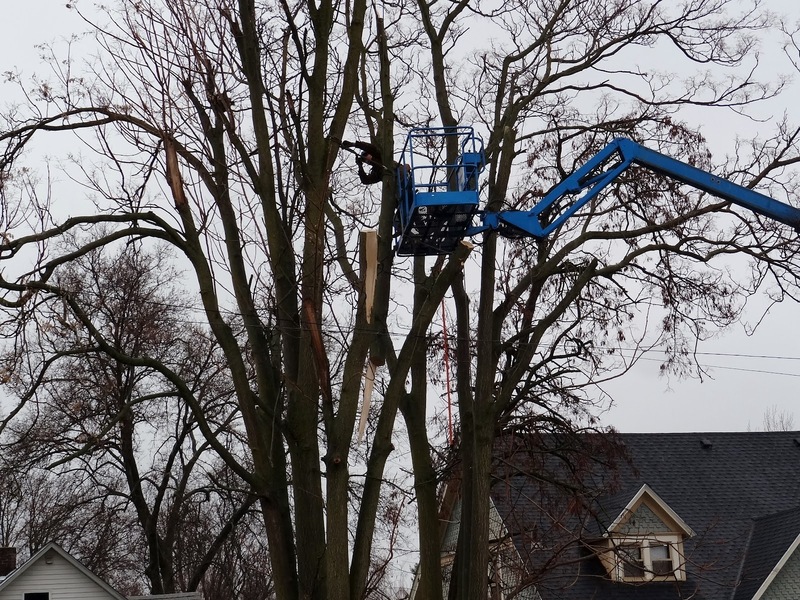 The guy who climbed up the tree to get it all prepped was part monkey...I'm sure of it. Fascinating to watch, huh? Now that will make taking care of the yard easier. That tree was huge. I have not ever heard of that kind of tree. Will you get more sun on your garden? 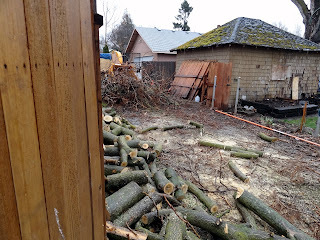 No matter how messy or invasive a big tree is, I think it is always sad to see it go. All that growing and growing only to be cut down. What a shame it wasn't in a good spot. We have had two really big trees taken down. I do agree. It is fun to watch! Wowzers. We may have a tree removed soon but I don't think it's this big. I haven't thought of pictures yet but I will have to make sure I get some! When you say "we came to an agreement," does that mean you helped pay for it or that you persuaded them to cut it down?